Believe it or not, you can remove super glue from almost anything. Super glue may save you in a pinch when making DIY Christmas decorations, magnets or even sealing a wound (yes, really! ), but it's also very challenging to get off when it ends up in the wrong place. TODAY asked home repair guru Lou Manfredini for the best way to remove super glue from furniture, clothes and skin. According to Manfredini, the one thing super glue doesn't like is acetone. However, "the problem with acetone is that you have to be very careful on what you're using it on," he said. 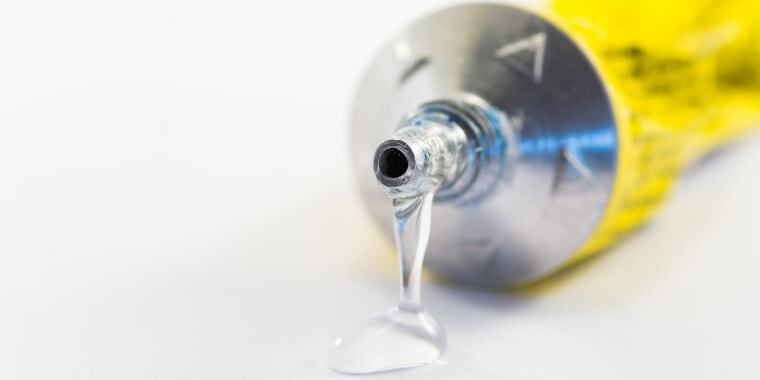 Acetone is a harsh chemical that can damage certain materials when used incorrectly, which is why there are different methods of super glue removal for different situations. Manfredini also noted that it is extremely flammable and is best used in a well-ventilated room. The best way to remove super glue from skin is to use an acetone with buffers in it, such as nail polish remover, to avoid irritation, Manfredini told TODAY Home. Apply the cotton ball to the glued area, making sure to completely saturate it. Hold cotton ball there until glue bonds start to release. Wash nail polish remover and leftover glue traces off with soap and water. Removing super glue from fabrics, such as clothing or upholstered furniture, is extremely delicate and may end up staining or altering the color of the material. Manfredini says that it's unwise to use nail polish remover on fabric because it usually has a color added to it. Instead, he recommends using 100 pure acetone, which is clear. If the glue is on a couch cushion, Manfredini suggests just flipping it over (after the glue has dried), if possible. That way, you won't risk damaging the fabric with the acetone. Note: Always test the effect of the acetone on the fabric in a small inconspicuous area first to see if it changes the color. Wet the cotton swab with acetone. Gently dab the it onto the glue area, without oversaturating the fabric. The glue should start to detach. If you can't or don't want to use acetone on certain materials, try softening the bond with mineral oil. This is an especially useful tip if it's an item — like a shirt — where you can apply the oil on flip side of the material. The oil will get absorbed into the fibers and can loosen the bond between the glue and the shirt. Afterward, just massage the glue right off. Depending on the finish of the surface, acetone may remove the top layer. This is especially important to consider when removing super glue from wood pieces, Manfredini told TODAY. Luckily, this method to remove the glue from wood furniture or other countertops won't damage the surface itself. Lightly dab the cotton swab on top of the dollop of glue for 10-15 seconds. Manfredini likens this to playing the game "Operation," because you want to be precise to avoid getting the acetone on the surface underneath the glue. Once the glue is soft, use a plastic putty knife to scrape it off. Run the knife along the edge of the wood or countertop and it will cut through the glue without damaging the material underneath. If you're worried that acetone will remove the finish of wood or another surface, using Goo Gone may help lessen the problem. Manfredini warns that this will take a long time and is not completely guaranteed to work.